George Decalve "Jack" McAdams, born December 17th, 1886 in Bryant, AR, was a professional baseball pitcher from 1908-1914, a professional manager in 1909, and a professional umpire between 1913-1924. He played 6 major league games with the St. Louis Cardinals in 1911. McAdams House in Bryant, AR. Courtesy of the Saline County Library. Jack McAdams was the youngest of five children born to L.C. McAdams and Laura Elrod1. The family lived in the small township of Bryant, AR2 and owned a farm about two miles south of there in a rural part of Saline County3. Jack's father was a staunch Democrat and Methodist whose success in agriculture allowed the McAdams family to own a large amount of land. The McAdams children attended a local school1, though two of Jack's sisters died before he became a teenager. Two other sisters went on to marry prominent local men. Jack himself grew to be a tall, slender young man with facial features that reflected his rural upbringing. Jack's athletic physique allowed him to become a skilled baseball player. He began pitching for local teams from nearby Benton and other surrounding communities and soon became well known in the area4. It was said he could make a baseball "look like birdshot" when pitching and even throw a ball around a corner from a block or two away. As Jack became more renowned for his pitching abilities, he was given the opportunity to pitch professionally. In fact, he may have made his first appearance in minor league baseball as early as 1906 with Pine Bluff of the Arkansas-Texas League5. A year later, he was given a tryout with Memphis of the Southern Association6, and in 1908, he earned a regular pitching job with Argenta of the Arkansas State League. There, he pitched with considerable success, and by mid July had won 18 games and lost only 96. McAdams' impressive record with Argenta caught the attention of the Atlanta Crackers of the Southern Association. 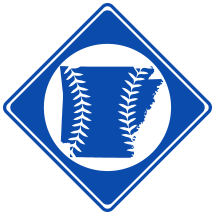 The Crackers were in the area that July playing a series with the Little Rock Travelers when they made a deal with Argenta to purchase McAdams7. On July 19th, the Crackers returned to Atlanta, and McAdams traveled with them, bringing with him much support from his friends and family back in his hometown4. His father went as far as to offer him one acre of land for every game he won with Atlanta. Unfortunately, McAdams' stay with Atlanta was only brief and he was unable to secure a win during his stay in the league. He made only two appearances with the team, walking 15 batters in 11 innings before Atlanta decided he wasn't ready for Southern League baseball. Instead, McAdams likely returned to Argenta8, finishing the season in the Arkansas State League with a 21-13 win-loss record9. The following season, McAdams was given a tryout with Spokane of the Northwestern League10. He failed to make the club, however, and went to Butte, MT to play in the small Inter-Mountain League11. When the league collapsed in mid-season, McAdams returned to Arkansas and earned a position as a player-manager with Marianna of the Northeast Arkansas League12. His success with Marianna was limited though, and under his leadership, Marianna finished next to last. Fortunately, his luck changed a little the next season when he played with Muskogee in the 1910 Western Association. No longer bearing the duties of a manager, McAdams performed very well. On June 11th, he pitched both halves of a doubleheader against Tulsa, allowing only 6 hits in 18 scoreless innings on the mound13. McAdams with St. Louis, 1911. McAdams' success with Muskogee garnered the interest of the St. Louis Browns of the American League. That June, it was reported that St. Louis had purchased McAdams from the financially struggling Muskogee club for more than $1,00014. The deal, however, fell through, likely because Muskogee was only guaranteed the money if McAdams was sold outright, and St. Louis wanted the agreement to be conditional5. As a result, Muskogee President W.L. Tull sent McAdams to Waco of the Texas League instead. Supposedly, McAdams was given to Waco for the sum of $4.70, the cost of McAdams' railroad fare to join his new team15. The nature of Tull's decision to give away McAdams when his club was in desperate need of finances is unclear. In any case though, McAdams jumped to Waco and finished the season there. After the season, McAdams was acquired by Dallas from Waco, keeping him in the Texas League for the opening 1911 season16. He reported to Dallas for spring training in February, and quickly began impressing the locals17. On March 4th, he was given the opportunity to start against a squad of New York Giants players in an exhibition game, and after striking out six batters across nine innings, he defeated New York, 3-118. McAdams' most impressive spring start, however, came on Sunday, March 20th against the Chicago White Sox. In that game, McAdams battled a 1-1 tie with Chicago's pitchers until the 11th inning when the White Sox finally got the best of him and scored the go-ahead run19. Despite losing, McAdams earned considerable esteem for striking out 14 batters and pitching into extra innings5. In fact, manager John McGraw of the New York Giants was very much interested in purchasing him, but Dallas decided to hold on to McAdams for the time being5. McAdams' early success that spring continued on into the beginning of the season. He was sent in to pitch for Dallas on Opening Day and in turn shut out Oklahoma City on three hits20. Dallas used him regularly, and on April 27th, he pitched both halves of a doubleheader against Waco, allowing only 1 run in both games combined21. A month into the season, he had won 7 games and lost only 122. About that time however, McAdams' busy pitching schedule began to wear on him. He came down with a fever that turned into malaria, and his performance suffered23. After several disappointing games, McAdams, undoubtedly frustrated by his health and poor pitching, began causing tension within the Dallas club24. The issue became serious, and manager James Maloney decided in June to suspend McAdams indefinitely for violating club discipline25. The move came as a surprise to many in baseball, and Dallas soon began receiving many offers to purchase McAdams26. Meanwhile, McAdams quickly left Dallas, supposedly heading somewhere with a better climate to help him fully recover from his illness27. In reality, however, McAdams, angered by his suspension, traveled to Huntsville, AL and took a pitching job with the local Southeastern League club under the assumed name of "Allen"12. He was still under contract with Dallas, and when news broke on July 7th that McAdams had been sold by Dallas to the St. Louis Cardinals of the National League, controversy was started. The deal, worth as much as $3,00028, left Dallas attempting to locate McAdams29. When it was discovered that he was in Huntsville pitching illegally, protests from the other Southeastern League teams were filed12. McAdams had appeared at least twice with Huntsville, and as a result, the protests were sustained by the league president. Upon the close of the season, St. Louis sold McAdams to Springfield, IL, who in turn sold him to Newark of the International League32. McAdams reported to Newark's training camp at Petersburg, VA the next spring to prepare for the 1912 season. He was met with high expectations32, but unfortunately, he was largely unable to live up to them. In May, after a rough start to the season, McAdams was sent to Galveston of the Texas League under the conditional agreement that if McAdams failed to perform well, he would be returned to Newark33. It did not take Galveston long to realize, however, that McAdams was simply unable to pitch as well as he had with Dallas the year before34. Consequently, Galveston released him back to Newark in June35, and Newark decided to release him outright33. Now a free agent, McAdams opted to sign with Denver of the Western League36. In July, a dispute over $70 made between he and former St. Louis teammate Harry Sallee made the papers, but was resolved when he was ordered to pay the debt to Sallee by the National Commision37. Otherwise, the rest of McAdams' 1912 season was fairly uneventful, save for a shift to Sioux City in mid August. He stayed in the Western League the for remainder of the season and finished with a 5-6 record38. After 1912, McAdams' never again played a full season of professional baseball. An arm injury, perhaps suffered as early as when he was with St. Louis, began to plague his career39. He signed with Fort Worth in 1913 and reported to spring training, but his arm troubles kept him from getting into proper condition and joining the team40. Instead, he began umpiring college games around the Fort Worth area41, and may have even briefly played outlaw ball in St. Louis42. In May, he tried to make an appearance with the Wichita Falls team of the Texas-Oklahoma League, but injuries again kept him from doing so43. He remained in the league for a time, however, as an umpire. Over the next couple of years, McAdams attempted several times to make a comeback in professional baseball. In the spring of 1914, he joined the Waterloo club of the Central Association44. However, on May 14th, in his first start of the season, he walked four batters in only 1 1/3 innings. He was subsequently let go to join an independent team in nearby Mason City, IA, with whom he appeared with in early June45. In July, he managed to earn a start with Austin of the Texas League, but lasted only 3 2/3 innings in a losing effort46. As a result, he did not make another start with Austin. In the spring of 1915, he tried again to enter the Texas League, this time with Shreveport. He was the first player to report for spring training, but arm injuries again troubled him and he was released before the start of the season47. Afterward, he may have tried to earn a tryout with the Chicago Whales of the Federal League, who had trained in Shreveport that spring48. If he did, he did not succeed in earning a position with the team. Instead, he went to Denver that July looking for a job, and in August appeared with a locally sponsored semiprofessional team known as the Sullivan & Hoffers49. This is McAdams' last known pitching appearance. 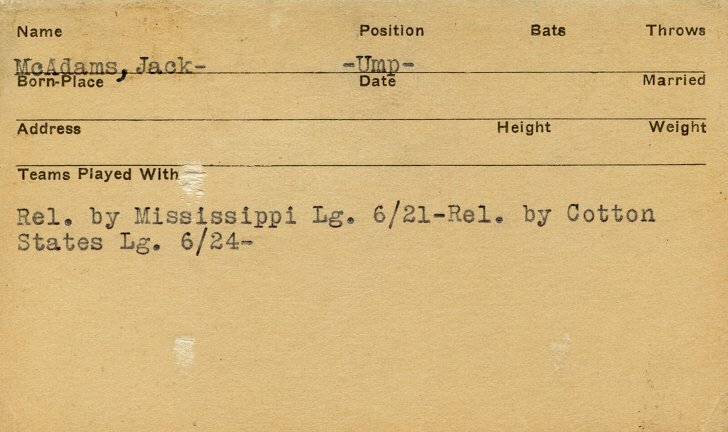 No longer able to pitch professionally, McAdams returned home to Arkansas, and by June, 1917, he was working as a railroad conductor for the Arkansas Short Leaf Lumber Co. in Pine Bluff, AR50. His baseball career, however, was not entirely over. He umpired for many years in numerous minor leagues, including in the 1921 Mississippi League51, the 1922 Southwestern League52, and the 1924 Cotton States League51. Later, he worked for the Missouri Pacific Railroad and eventually moved to California53. At some point, McAdams married and had at least one child50. While in California in 1937, McAdams was admitted to a San Francisco hospital, and on May 21st, he died at the age of 5053. The remains were returned to Arkansas and a funeral was held at the home of his sister Nancy. He was interred at Bryant Cemetery in his hometown. For contemporary newspaper excerpts concerning McAdams, see Jack McAdams Excerpts. 8. McAdams' 21-13 record suggests he pitched 7 more games with Argenta sometime after being sold to Atlanta.